Mysterious aliens have invaded the Earth-like planet of Corliss, slowly draining the planet's resources. 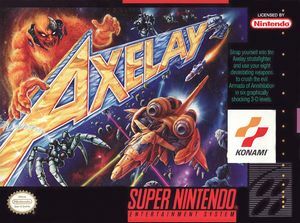 Take control of the prototype Axelay ship and use its wide range of advanced weaponry to battle enemy forces. Play through multiple stages of action --from other planets to space stations -- all on your way to destroying the alien headquarters. The graph below charts the compatibility with Axelay since Dolphin's 2.0 release, listing revisions only where a compatibility change occurred.